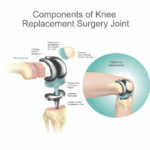 The three most common types of arthritis are degenerative arthritis, rheumatoid arthritis, or post-traumatic arthritis. Arthritis describes damage to, or “wear-and-tear” of the smooth, slick, cushioned surface that coats the end of the bones at the joints. 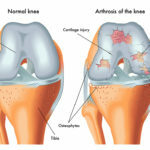 Degenerative arthritis if the knee, also called osteoarthritis, is a normal “wear-and-tear” condition which progresses with age. However, this can be found in younger people as well. The second most common form of arthritis is rheumatoid arthritis, which is auto-immune in nature. The third most common arthritic condition is post-traumatic arthritis which develops after having a previous injury to the knee. All three of these result in pain, swelling, and loss of mobility. There are also many other, less common variations of arthritis. Osteoarthritis is characterized by progressive loss of joint space as the cartilage thins. Eventually, this can result in “bone-on-bone” grinding in the knee and the secondary development of bone spurs. Bone spurs are not often a cause of symptoms but an indication that the joint is wearing out. Osteoarthritis can cause difficulty with normal daily activities such as walking, climbing stairs, carrying heavier items, or getting up and down from low chairs. Pain and stiffness are often worst in the morning and improve as you get moving. Pain can sometimes interrupt sleep and make it difficult to get comfortable at night. Currently, there are no treatments that can cure osteoarthritis but medical management is aimed at moderating pain and keeping people moving. Conservative treatments include: activity modification, weight loss, short courses of oral anti-inflammatories (if no contraindications), over-the-counter pain medication, injections, bracing, and home or formal therapy to maintain strength and range of motion. Surgical treatment with a total knee replacement would be indicated when conservative treatments fail to control symptoms to a tolerable level. Rheumatoid arthritis is an autoimmune disease where multiple joints can be attached by the body resulting in softening of the bone, damage to the cartilage, and damage to the ligaments. There are medications designed to slow or control the damaging effects of this disease. People with rheumatoid arthritis are usually under the care of a doctor that specializes in arthritis called a rheumatologist. Intermittent steroid injections in the knee can help control symptom flares.